"Those old war horses never shut up." Whether chatty horses, philosophical dragon mounts, or calculating cars, some characters have modes of transportation that talk back. Useful because it justifies/averts Automaton Horses, as well as providing sage advice, companionship, and enabling some really cool stunts. Often Hilarity Ensues if the rider accidentally 'forgets' this, treating their steed like a normal animal. Subtrope of Sapient Pet. Compare A Boy and His X, Living Ship, Sapient Tank and Space Ship Girl. Prone to Horsing Around if you piss them off. Likely to be a case where Only the Chosen May Ride. Often part of a Smart Animal, Average Human duo. See also: Bond Creatures and Mechanical Horse. All the B'ts in B't X, which are also Mecha Mounts. Hermes the motorcycle from Kino's Journey. The Arbalest's AI from Full Metal Panic! is milestones more advanced than the others because he's capable of learning. Sousuke is thoroughly frustrated with him because, unlike his previous mounts who merely helped operating the mecha, Al does talk back to him if he knows he's right. Once during The Second Raid, the mecha chewed out his pilot, saying that he's not going to operate for him properly until he treats him as a partner. And then in the TSR OVA, when Sousuke was glomped by his half-asleep and half-naked superior in the hangar (scaring the beejesus out of him), Al was humorously commenting on the situation despite Sousuke's repeated orders to shut up; when she woke up and ran away in fright, he told Sousuke to go after her which he rebuffed with a loud "SHUT UP!" In the manwha "Yongbi". The Bounty Hunter Yongbi rides a horse that's basically a medieval Korean version of Maximus from Tangled. He's intelligent (he was able to determine the worth of a golden medallion offered by a boy they rescued just by licking it) , stubborn , rather arrogant (during a stay in the emperor's stable he forces the servants to serve him hoof and foot and pushes around the other stable horses), defiant , VERY expressive , a pervert , has a sense of humor , and constantly bickers with his rider like an old married couple. Magical Girl Lyrical Nanoha Strikers has Storm Raider, an Intelligent Device whose AI was transferred to a helicopter when her owner retired from sniping to become a pilot. She gets transferred back to her weapon form near the end of the season. 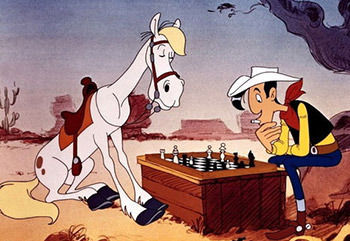 Lucky Luke's horse, Jolly Jumper, which is also really smart (sometimes he plays chess, and once he was fishing without Luke's help). Falada in "The Goose Girl", in the original Grimm story and all adaptations, such as Shannon Hale's novel by the same name. The Tuvan epic poem "Boktu-Kirish Bora Seelei": Bora-Seelei borrows her brother's clever talking horse, who thinks up various schemes for Bora-Seelei to win the favor of the magical Princess Angyr-Chechen, who has the ability to bring Boktu-Kirish back to life. Nobody Dies did this with Neon Genesis Evangelion. And it's Crazy Awesome. In the My Little Pony fanfic The Son of the Emperor, ponies are intelligent, capable of speech and exist alongside humans. Some even hold positions in the military or are nobles. And in another fanfic, Wild Sweet and Cool, 'tandem racing' is featured where one (normal-sized) pony rides another; teamwork is, of course, vital. Donkey briefly in Shrek 2. Otherwise he isn't actually a steed. Tangled has Maximus, who goes from being the horse of the captain of the guard at the beginning to being the captain of the guard by the end. He's separated from his rider very early on but pursues Flynn throughout the whole film and even wields a sword with his mouth. He's about as badass as a horse can get. He doesn't talk, but has vocalizations provided by you-know-who. Played with with Sven, who doesn't talk, but instead is "voiced" through Kristoff in the manner a dog owner would imitate their pet talking. He does display considerable intelligence and even tries to directly force Kristoff to return to Arendelle. Hans' horse (named Sitron by virtue of Ascended Fanon) also displays intelligence in his short time onscreen, "bowing" for Princess Anna and later waving at her (seeming oddly interested in her as he does so). The characters in BIONICLE 2 don't realize that the Kikanalo beasts are this, until Nokama's Mask of Translation activates and she starts having a conversation with them, after which they offer to carry her and her partners around. Although it turns out the Kikanalo could understand what they were saying anyway. At the end of Godzilla Tokyo SOS, Kiryu (AKA Mechagodzilla 3) says "Goodbye, Yoshido" to the pilot inside of him before committing a heroic sacrifice by sending both himself and Godzilla deep into the bottom of the ocean. Yes, folks, this film has The original 1954 Godzilla talking (Well, technically, it's a message that appears on one of the monitors inside his cyborg-body) to a human being. Benny the Cab from Who Framed Roger Rabbit is a Sentient Vehicle example. Before there was Mr. Ed there was Francis The Talking Mule. Chitty Chitty Bang Bang: the titular car is at least semisentient, rather impatientnote At one point when it felt that the knob labeled PULL wasn't being pulled fast enough, it changed the label text to PULL IDIOT., quite bravenote Near the end, it actually rammed the Big Bad's getaway car because he had kidnapped the children, and deeply loyal to its owners. Also, the driver swears that while he was restoring it, he would often find that it had been advancing its own repairs and even modifying itself while he slept. Cactus Jack's horse Whiskey in the western comedy The Villain doesn't talk, but he's far smarter than his nominal owner. Horse: My name is Phillip! Dilvish's steed, a steel horse that's the embodiment of a demon, in Roger Zelazny's Dilvish, the Damned. Eshinarvash and other Wise Horses from the Firekeeper Saga series of books are sapient and intelligent, they only lack the ability to speak to humans other than Firekeeper (and, later, Derian). The people of Liglim can work around this somewhat, through use of rituals and divination they use to read omens of the future. In The Silmarillion, the hound Huan allows Lúthien to ride him. Although his nature is never quite clear, he is very much in animal form, obviously sentient and even speaks three times. Shadowfax (Gandalf's horse) is at the high end of reasonable horse intelligence. He regards it as his business to see that his rider doesn't fall off, so no saddle is needednote Assuming he's willing to let you ride; if he's not, a saddle wouldn't help anyway, and at least once he meets Gandalf as if he knew he would be needed. Old Bill, the pony the hobbits buy in Bree, also seems to be fairly bright for a horse. The Wargs often ridden by Orcs are an allied race with their own language and culture, not domesticated animals. Similarly the Giant Eagles that occasionally give the heroes rides. In The Chronicles of Narnia, some horses and most unicorns talk; this is most prominent in The Horse and His Boy. The two main horses in that book have quite humorous personalities, especially with Bree trying to figure out what is acceptable for a talking horse, having grown up among dumb ones. Although it is slightly subverted when it's noted that in Narnia talking horses are only ridden in times of war and that suggesting they be ridden except in great emergencies is very rude. The Never Ending Story has Falcor. Artax also talks in the book. Late in Robert A. Heinlein's novel The Number of the Beast, Zebadiah Carter's spaceship "Gay Deceiver" becomes sentient and is able to talk intelligently. Dora (spaceship, Time Enough for Love and subsequent) certainly fits this trope if Gay does. Also, in the Incarnations of Immortality series, Death's Pale Horse "Mortis", who can also transform into a pale car (whose license plate is MORTIS), is sapient. He tells the current incarnation, Zane, that a previous master of his used the switch-bladed scythe as a blowgun once. The Companions are Standard Issue. Those Heralds recruited late in life have occasionally expressed their annoyance, especially as said steeds are mentally bonded to their riders. They usually get over it pretty quickly; the advantages outweigh the drawbacks, and if you don't think so, you're not the sort to be Chosen anyway. Strictly speaking, Companions aren't horses, and tend to get quite insulted when somebody refers to them as such. They're high-level Guardian Spirits who have taken on a four-legged form as a matter of convenience. In the same series, the Hawkbrothers are allies of dyheli, which they ride instead of horses. Sapient deer with Psychic Powers make better mounts in the Hawkbrothers' native forests, and allow themselves to be ridden as one of the assets they bring to their partnership with the humans. Mercedes Lackey's urban fantasies feature Elven Steeds, who can also turn into cars. Or motorcycles, or whatever they feel like, really. They don't talk but are quite intelligent nonetheless. There are a few occasions where it's hinted that they can communicate, mostly by flashing their headlights, but can't actually talk. In Born to Run one of the Elven Steeds communicates telepathically with its rider to plan how to distract one of the villains. In Christopher Stasheff's Warlock of Gramarye series, Rod Gallowglass's horse is actually a cybernetic body and a basketball-sized computer. His name is "Fess" and he's effectively epileptic, since there's a connection that overheats and blows when he encounters something he isn't programmed to deal with — like magic. The reset button is in the pommel of the saddle. In P.C. Hodgell's Chronicles of the Kencyrath series, the almost immortal Whinno-hir breed of horses understand speech and frequently establish mental links with chosen Kencyr people. They do not speak, but can make themselves understood; they appear to be near human in intelligence. They appear to be able to take human form for brief periods. The carnivorous, armored unicorn-like rathorns, meanwhile, appear to be as intelligent as dolphins or chimpanzees; while they do not have anything like speech, they can still convey fairly complicated concepts over a mental link or with e.g. body language. The smallest dragons in the Temeraire series play this straight, while most of the others (including the title character) straddle this trope and Living Ship. Coursers in The War Gods series by David Weber. Even given citizenship, but they can't talk to any except their bonded riders or Magi. One of them bonded with a Champion (the series equivalent of Paladins) and as a consequence ended up becoming a Champion himself. Inverted in The Belgariad with Hettar, a Horse Lord, capable of speaking to horses and understanding them in return. Since it's not tied to a specific mount, he can do it with any horse he happens to be riding. Garion also figures out how to do it, though the horse he tries it on is young, and not too bright, so it doesn't work too well. Hettar's ability is akin to telepathy. He tries it once with the steeds of the bad guys. It turns out they just look like horses. He's able to contact them, but really wishes he hadn't. Faran in The Elenium is a foul-tempered warhorse who only Sparhawk can ride. He's very intelligent, but also highly opinionated and quite fond of showing off. Aphrael once told Sparhawk the main reason Faran acted the way he did was because Faran knew that's what Sparhawk wanted in his steed. Cohen the Barbarian has a talking horse in the Discworld short story "Troll Bridge". He hadn't known it was magical when he got it, and if he'd known it was going to complain all the time, he wouldn't have bothered. He's got rid of it by Interesting Times. Binky, Death's Horse might be up to this level, but it's never actually stated just how much more intelligent he is than normal. He doesn't talk, though. Camels, even if they can't talk, are still brilliant mathematicians and intelligent enough to pour disdain on their owners. In Eragon, dragon-riders can talk to their dragons. Dragons can also talk to other people if they connect to that person's mind. In Terry Pratchett's The Dark Side of the Sun, some of the Mechanical Horses are Class 5 robots, making them human for all intents and purposes. Anna and her descendants in Leo Frankowski's Conrad Stargard series are guessed to be about as intelligent as a 6-8 year old. Within the books, it's indicated that they might even be smarter than that, but have been hiding their abilities since they're essentially genetically engineered slaves. The titular alien dragons of the Dragonriders of Pern series are telepathic and intelligent. They can speak to other dragons, fire lizards (their genetic precursors), their own riders, and the very rare humans with greater telepathic potential who can communicate with all dragons. One difference in dragon and human mentality is that dragons don't have a very strong grasp of the past or the future and mostly live in the here and now. The Titanides of the Gaea Trilogy do not mind being ridden. Especially when the alternative is checking their speed on behalf of the slowpoke humans. The Skybax in Dinotopia, although you have to either speak their language to communicate, or have a translator Protoceratops around. (with the exception of Windchaser, who did speak human.) And a ton of other dinosaurs in the series as well. Used a few times in Animorphs, when Cassie morphs horse. Once, she's in horse morph with Tobias in Hork-Bajir morph on her back. Is the case in The Gandalara Cycle by Randall Garrett. The protagonist's, (as well as other characters of the same creed), bond creature is a giant fictional lion-tiger hybrid called a sha'um, (which is bigger at the shoulder than a clydesdale horse!) that has immense strength and speed. The sha'um, though extremely loyal, are also quite picky on who gets to ride them outside of their bonded, and will get insanely jealous if their selected bonded rides another without their permission. As a bonus though, they can lend their physical strength to their riders when separated in time of duress. The horse ridden by Xuanzang in Journey to the West. However, it is no ordinary horse but a dragon who is the son of a sea god doing penance for his earlier errors. This tradition begins in the Tortall Universe with Cloud, Daine's pony in The Immortals. The girl's wild magic means that the pony has become much more intelligent than a normal steed, able to strategize like a human and understand language. Over time, every horse (well, animal) around Daine also changes in this way. Eventually the palace's horses are basically seen as equal partners to most knights and soldiers. Valadan in many of Susan Dexter's books. Capable of communicating telepathically, immortal, and chooses his own rider. Incredibly fast, reasonably enough, as he's only half-horse — the other half being wind. Rhyshadim in The Stormlight Archive are stronger, faster, and bigger than regular horses, and a whole lot smarter. They pick one human, who is the only one that gets to ride them, and will not tolerate any other rider except under the most bizarre circumstances. When Adolin's Rhyshadim is killed by Voidbringers in Words of Radiance, it is treated exactly like losing a very good human friend. Animals in Oz are established as sentient and able to speak. This also applies to animals entering Oz and other fairy lands, for instance Jim the cab-horse in Dorothy and the Wizard in Oz. The animated Sawhorse is also sentient and can speak; he has a debate with Jim as to which of them is superior. This does not apply to Wicked, which was not written by Baum. The telepathic horse Maureen rides in the short story "Maureen Birnbaum on the Art of War" (based on the Horseclans series). Because she can communicate with it, she names it Mister Ed. The Electric Monk's horse in Dirk Gently's Holistic Detective Agency doesn't talk, but does have some well-thought out and deeply cynical opinions on life in general and the Monk in particular. The novel states this is actually perfectly normal for horses: it's very hard to be sat on by another species every day and not come to some conclusions about them. Zig-Zagged in the Ranger's Apprentice series. It's lightly implied at times that, although they can't talk, Ranger horses are intelligent with surprisingly expressive body language, and most shown Rangers have had a conversation with their steed at least once. It's sometimes stated that it's simply Ranger superstition, seeing "talking" where there are none on long journeys, only for a Ranger horse to do something that could be interpreted as a response to that claim. There's evidence for non-intelligence and sapience, and throughout all the books it's never explicitly confirmed one way or the other. KITT from Knight Rider, who is arguably more The Hero than Michael at times. In the 1998 Merlin miniseries, Merlin has a horse named Sir Rupert. He can talk. This is not explained in the show itself, but if you read the novelization it'll tell you why. Mister Ed is a horse, of course. Yu Lung, a.k.a. "Horse", the horse who is really a dragon from Monkey. In The Adventures of Brisco County, Jr., Brisco seems to carry on intelligent conversations with Comet 'the wonder horse'. In South African childrens' show Die Liewe Heksie, Livinia the witch has Griet the magical taking horse as her sidekick. Sesame Street has Marshall Grover's Fred the Wonder Horse and Forgetful Jones's Buster. In both cases the horses are significantly smarter than their riders. The Dragonlance setting has many dragon riders whose dragon mounts can talk. Inverted in one short scenario from Dungeon Adventures magazine, in which an evil spellcaster used a feeblemind spell to render a centaur druid mindless, then hitched him up to pull a wagon. The PCs must rescue this unlucky sentient being from the fate of an unspeaking beast of burden. Paladins' mounts have an Intelligence of at least 6 (not as smart as the average Humanoid (10) but smarter than any animal (1 or 2), and they get smarter as the Paladin gains levels. Given that Intelligence is about the only Dump Stat that Paladins have, it is relatively common for a mid-to-high level Paladin's mount to be smarter than they are. There are quite a few creatures — most commonly worgs or nightmares — that are smart enough to be considered sapient or even learn to speak intelligibly but traditionally serve as mounts for other creatures. Rifts took it a step further with Blood Lizards and Psi-Ponies, who were not only intelligent, but you could even use them as a Player Character. In Ars Magica it is entirely possible and not uncommon for supernatural horses (Divine, Faerie, Infernal, or Magic) to be both as intelligent as their riders and possessing various magical powers (Aeolus, a sample character from 'Realms of Power: Magic' is a good example). Magi tend not to rider animals due to the effects of The Gift, but they make entertaining characters in their own right. Rhy-Horses in Blue Rose are an example of this. In Twilight Princess, Midna treats Link like this whenever he is a wolf. In other words, you are her Sapient Steed. True, but not really of the most talkative kind. While she doesn't have much to say, Epona is able to speak to Link while he is a wolf. The Oracle games feature some rather unusual mounts in Ricky, Moosh, and Dimitri, who are a kangaroo, a flying bear, and a dodongo, respectively. All of them can talk. In the background the Drakes, Hippogryphs and Wyverns players can fly in World of Warcraft are all sentient beings. Drakes in particular are as intelligent as humans and can even speak. However ingame they act like all other mounts. However there are a few quests where the player flies on a Drake or Dragon that does speak. Yoshi of the Super Mario Bros. series. In his first appearance he can speak and seeks out Mario as an ally. His later appearances alternately depict the Yoshi race with a distinct language that the main Yoshi translates, or a shared common language. They've also been shown to have some culture, and build shelters as well as monuments. According to the first Super Smash Bros., the species is even said to have a high I.Q. from a very early age. In the backstory, Morihaus, an Aedric demi-god who took the form a "winged man-bull", appeared as an answered prayer of St. Alessia (as part of her Bargain with Heaven) to aid her armies in battle against the Ayleids. It is said that Alessia rode and flew atop him. Deus Ex: Invisible War: features an AI-piloted helicopter. In Ace Combat 3: Electrosphere you turn out to be one. Latios and Latias of Pokémon fame are able to give their trainers a lift and are Intellectual Animals capable of communicating through telepathy (good luck knowing the latter from the actual gameplay though). In Gunnerkrigg Court, the Model H's can be chatty. One of them in particular recites Paradise Lost while transporting the girls to the barbershop. Ultra Car of the Walkyverse is kind of a Jerkass and has been known to leave his passengers in the Amazon. Arthur from Faux Pas fills the role, as do some others from time to time. In UNA Frontiers, there are Shiratz, an ancient alien probe built to look like a convincing horse, and the G.E.M. 's - a subspecies of genetically modified Morgan horses about as intelligent as dolphins or gorillas in general. Some of them have "high talent", i.e., psychic abilities to boot. Charismatic Seaweed, who is Eva's special Paladin Mount in Our Little Adventure. The Order of the Stick also features Paladin Mounts, notably Windstriker (a white stallion), Argent (a large wolf) and Razor (a great white shark). Windstriker, notably, is shown to outsmart Belkar Bitterleaf regularly, which makes the halfling develop quite the grudge against the horse. In the The Thrilling Adventure Hour podcast, the Space Western segment "Sparks Nevada: Marshal on Mars" features a horse named Mercury who gains the ability to talk and turns out to be surprisingly cognitive for a horse. Marc's horse in The Penumbra Podcast appears to be this, as it can seemingly understand everything says. Thirty/Thirty from Bravestarr who is not just sapient, but bipedal when he wants to be. C.A.R. from The Replacements (who might just be the most sensible member of the cast). Twinkle the Marvel Horse from Dave the Barbarian. Battle Cat from He-Man and the Masters of the Universe (1983) (but averted as Cringer, who doesn't act as Adam's steed). "One more crack like that and you're walking!" He doesn't talk in the remake, but he still seems smart enough to fit the Trope there. Used, of course, in My Little Pony on those rare occasions where a primary character gives a biped a ride. If the toys count, then the titular ponies of all the various animated series probably should, too. Such as My Little Pony: Friendship Is Magic's Twilight Sparkle being ridden by Spike in the episode "A Dog and Pony Show". In "The Best Night Ever" two stallions pull the ladies' carriage to the Grand Galloping Gala. Just like any other horse in this world, they have 100% human intelligence, and it's clear that Spike need not flick the reins. In the pilot, Twilight Sparkle rides a flying chariot pulled by a pair of pegasi. It seems to be Equestria's equivalent of a taxi. In "Over a Barrel", when Braeburn is giving the girls a tour, he tells them that the town has "horse-drawn carriages", then we see a stallion pulling a carriage, stop, and tell the passenger that it's his turn to pull. Wildfire, from the '80s cartoon of the same name, was a massive black talking horse whose life's mission was to protect Princess Sarah until she grew up sufficiently to get her magical kingdom back. She-Ra: Princess of Power: She-Ra's horse Spirit, who can transform (with She-Ra's help) into her flying, talking unicorn Swift Wind. One episode revealed that the planet of Etheria was home to an entire island of talking winged unicorns. The 2018 Remake sees Adora accidentally transform a random horse into a winged unicorn in an early episode. After a bit of a Freak Out over the new appendages (along with, presumably, the suddenly increased cognition) he periodically aids She-Ra in between learning humanoid speech and plotting equine liberation. Sylvia of Wander over Yonder doubles as a mount and a wise friend to Wander.